I have to admit, Sicilian food has always been something of a mystery to me. Many Sicilian dishes remind me of Angelina’s Campanian cooking—and Sicilians actually lay claim to melanzane alla parmigiana, one of her signature dishes—but there is something ‘different’ about some of the taste combinations you’ll find in Sicilian cookery, especially the tendency to combine sweet and sour. La caponata, one of the most famous Sicilian dishes, is a good example. A kind of southern cousin to the ratatouille of Provence, this dish stars eggplant, with celery co-starring and with tomato and onions in supporting roles, along with capers and olives, typically southern Italian flavor boosters. And, yes, it has a sweet-and-sour finishing touch that, if not overdone, perfectly balances out the flavors. The first step in this recipe, which is not absolutely necessary but a good idea, especially for larger, more mature eggplant, is to remove the excess liquid from the eggplant by sprinking the eggplant cubes with salt and placing them in a colander, with a small plate on top to exert some gentle pressure and one below to catch the eggplant liquid as it drains. Let the eggplant steep for an hour or more. When you are ready to cook, gather up a handful of eggplant with a paper towel, give it a gentle squeeze to dry the cubes, and throw them into abundant olive oil—about 1 cm (1/2 in) deep—in a large pot. (Enameled cast iron pots work particularly well.) Work in batches to avoid crowding the eggplant, removing them with a skimmer when the eggplant cubes are just lightly browned to a basket or bowl lined with paper towels to soak up the excess oil. When all your eggplant is done, there should be less oil in the pan, but still enough to cook with. Add the celery, sauté for a few minutes until the celery is tender but still has some ‘bite’ left in it. Season with salt and pepper as it cooks. Remove with a skimmer and set aside. Now add the onion to the remaining oil in the pot and sauté it gently until it is quite soft. Add the tomato. Simmer the tomato until it has melted and reduced to a nice, sauce-like consistency. Now add back your eggplant and celery, along with the capers, olives and the marjoram. Allow everything to simmer together for about 5-10 minutes. A minute or two before it’s done, add the sugar and vinegar, mix well (but gently!) and let it finish simmering. Turn off the heat and let the dish cool entirely before serving. There are two main points to watch out for when making caponata alla siciliana. First, depending on the quality of the eggplant, it may become very soft and, if it gets stirred too often or too vigorously, it will turn to mush. You should be very gingerly when mixing—a spatula will do a better job here than a spoon. It also helps to brown the eggplant over high heat; this way it will brown before getting too soft. The final simmering together of the ingredients should also last a few minutes. The initial steeping of the eggplant in salt also helps. Besides removing the often bitter natural liquids in the eggplant, it produces a firmer texture. Recipes vary as to how long you should leave them to drain; some call for several hours, but with most eggplant an hour will do. In fact, even 30 minutes will help. The size and age of the eggplant will determine how long you will need. Smaller eggplant, by the way, tend to be firmer and are less needful of this initial step. The other point is greasiness, since everything gets cooked in abundant oil. Now, of course, one person’s greasy is another person’s unctuousness, and this dish will never be fat-free. But if you want to lower the oilyness (and the calorie count) there are a few tricks. First, as mentioned, fry your eggplant at high heat, this will limit the amount of oil that the eggplant will absorb. Make sure to sop up the excess oil with paper towels. The same goes for the celery. And once the dish has cooled, if you find the resulting dish is a bit too rich for your taste, you can either skim the excess oil off with a spoon or even (as I did last night) strain the entire thing over a sieve for just a minute or two to allow the excess oil to drain off. By the way, most recipes for caponata alla siciliana will tell you to fry the eggplant and celery separately, and then sauté the onion in yet another pot. That strikes me as yet another way to wind up with a greasy dish; my ‘one pot’ method works perfectly well and saves you some clean up afterwards. Traditional recipes will tell you to de-string the celery and blanch it before sautéing, because in the old days celery was very strongly flavored and had tough filaments. Modern celery (at least here in the US) is raised to be almost ‘stringless’ and very mild in flavor. If in doubt, take a bite and see if these preliminaries are needed. The capers should be the kind packed in salt, in which case rinse them and, if they are very salty, you may want to soak them for a few minutes. But the kind packed in brine will do fine in a pinch. Of course, if you can find imported Sicilian capers, in particular the famous capperi di Pantelleria, that would be perfect. Since this is obviously a summer dish, fresh tomatoes rather than canned are traditional. But unless you are sure of the flavor and freshness of your tomatoes, to my mind canned is probably a better choice. I’ve also seen recipes with considerably less celery and/or tomato. Other recipes add tomato paste for a ‘redder’ version. In short, you can play with the proportions and ingredients—but whatever you do, the eggplant should always be the star of the show! How much sugar and vinegar, you ask? Well, I tend not to measure, but a couple of spoonful of sugar along with a splash of the vinegar (I prefer the white wine variety) should do you fine. Add more if you want a more pronounced sweet and sour flavor, but I like just a hint. Caponata is said to be of Spanish origin and, like many Italian dishes, has an interesting history, which you can read about here. When all your eggplant is done, there should be less oil in the pan, but still enough to cook with. Add the celery, sauté for a few minutes until the celery is tender but still has some 'bite' left in it. Season with salt and pepper as it cooks. Remove with a skimmer and set aside. Now add back your eggplant and celery, along with the capers, olives and the marjoram. Allow everything to simmer together for about 5-10 minutes. A minute or two before it's done, add the sugar and vinegar, mix well (but gently!) and let it finish simmering. Turn off the heat and let your caponata cool entirely before serving. I wished chefs write recipes the same way you wrote yours, It is well structured and detailed followed with a couple of tips in making sure the end result is a perfect meal. Excellent work, will definitely look for more recipe on your site. Many thanks, Mohamed, for your comments and kind words! Please do come back and visit our site any time! IO sono Siciliana e la caponata classica non l'ho mai fatta, perchè non la so fare, eh eh! Però di una cosa posso testimoniare: pinoli e noci non ci sono nella ricetta. Assolutamente no! Sicilian food is by far my favorite, so varied and delicious! I hope you make it there one day to see what all of the hype is about! Thanks for stopping by, folks! @Spicie Foodie: If you do try it, let me what you think. Even if you didn't get to Sicily, it seems like you captured the caponata perfectly. Every time I make it, it seems to come out differently. Hello Frank, it has been a while since we last exchanged words. Hope u're well. Wow, your title sounds exotic & so does your recipe 🙂 Lovely post! @Arturo: Of course, I'd be honored! @Drick: See Winelady's comment just above yours—seems you can, indeed, roast the eggplant to cut down on the oil content. I'll have to try that next time and see how it goes! I understand what you're saying about Sicily. I love visiting Italy, but there's so much to see when there that going down to Sicily doesn't cross my mind. I still haven't experienced all that I want to experience in the north! That being said, after looking at this dish, I might have to rethink things. If we ever head that way again, maybe dipping south will be well worth it. the flavor must be incredible… I wonder, would roasting the veggies do as well? and interesting of the celery, I have not thought of the strings in years…. One of my favorite childhood dishes is caponata. My sister and I still make it but we cut back on the oil by roasting the eggplant cubes. We then saute the rest of the ingredients. That way the final dish is not 'greasy' in the event the eggplant would soak up all the oil. Thanks for sharing this. It's really a very easy dish to prepare and can be served as an appetizer, or served over pasta which is how my friend likes to serve it. Hi Frank. I just love eggplant and this recipe is just amazing. I'm thinking on translating and maybe changing a bit for my latinamerican website. Would it be ok with you? I'd give you credit and a link to your blog of course. Caponata is one of my mom's signature dishes!!! I always ask her to make it whenever she comes here to visit!!! I LOVE it! True… Sicilian and Campanian cuisines are similar yet soooo different (if that makes sense ;-P)! You've done a great job! Simply an amazing recipe. I am usually stuck in the way I prepare eggplant. But your recipe has given more some inspiration to think outside the box! Grazie! The best part of this dish? The pignoli! 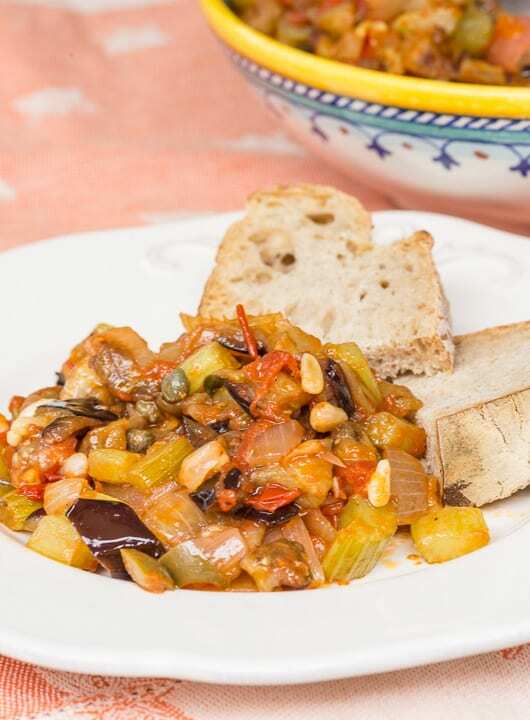 The word caponata always reminds me of Commissario Montalbano. I make my version in the summer, when both eggplant and tomatoes are available at the farmers' market. I hope to get to visit Sicily one day! Thanks, folks, for your kind comments! @Dianeuk: An interesting idea! I'll have to try it some time, always game for a new variation on the classics. @renaccio: A bit of anchovy sounds like a great addition, a bit of savoriness that goes very well with the olives and capers, I have to imagine! I love caponata and the first time I tasted it I couldn't get enough of those wonderful flavors. I've always used the recipe from the Tornabene's book “Sicilian Home Cooking”. They include anchovy in their recipe. When I was a catering in the US many people requested caponata and I was so happy to make it. I even saw little cans of it put out by Progresso! Now, as an americana living between Florence and Arezzo, naturally caponata is a foreign food to the locals but I still love it and make it every so often. My Florentine sig oth isn't all that crazy about it but I think it's b/c he's not a big eggplant fan. Agrodolce does show up in Tuscan recipes..such as coniglio and cinghiale dishes. I love Sicilian cuisine and I'm fascinated with the exotic flavor combinations used in their cooking. I spent more time in Sicily before I ended up here and my intro to the Italian kitchen was through Sicily..although in these parts they'd say that isn't italian. I love all the influences that make Sicilian cuisine what it is! Come mi piace la caponata! Seriously one of the best recipes ever invented! I love it. A trick to it, especially if the eggplants are not too good, is to salt the eggplants and let them render water for 30 min or so before rinsing them and cooking them. This extra step really does great things to the taste of this dish. I'm with you on the sweet and sour. I love eggplant parm (and, keep your recipe close!) and involtini and ratatouille. But, until last summer hadn't tried caponata because of the sweet and sour. Once I tried it, I was hooked! Ciao! Great recipe! Part of my Italian ancestry comes from Sicily! I have been experimenting with your recipe for pizza dolce and have come up with the addition of halved white seedless grapes stirred in before baking – very nice and gives lots of moisture…..As it is strawberry season I have also served it piled high with strawberries macerated in a little lemon and sugar. Now I guess it's off to the shops for some egg plant/ aubergine/ melanzane. Keep the recipes coming your blog is great source of inspiration and a great memory jogger.